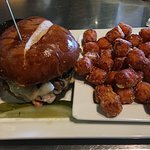 Including other sandwiches, pasta and salads.Delicious pig wings and amazing sweet p...... a basket of sweet potato tater tots!They have salads and pasta, but burgers are their thing. Rehab dressings include; ranch, blue cheese, italian, chipotle ranch, caesar, pomegranate vinaigrette, 1000 island, ff sweet serrano and oil and vinegar. Romaine, tomato, cucumbers, croutons and colby jack. All the goodies that washed upon these shores. A‎ classic caesar with 2 types of parmesan and homemade dressing, this old time tijuana cure will settle even the highest of fliers. Romaine lettuce, shredded parm, shaved parm and croutons with caesar dressing. Shweet and tashty, ur shurely in for a treat. Spinach and romaine blend, avocado, blue cheese, fresh strawberries, candied pecans and pomegranate vin dressing. Not sure what mrs. da vinci was doing in spain, but leonardo's long lost spanish brother brought us this spicy chicken ensalada. Romaine and iceberg blend, chicken with peppers and onions, cotija cheese, colby jack, tomato, cilantro, tortilla strips and scallions tossed with chipotle ranch and topped with sour cream. Need a fix...of protein that is, then this cobby concoction will surely satisfy. Turkey, bacon, ham, hardboiled egg, romaine, swiss, candied pecans, rehab onions and your dressing of choice. If you've ever had a wedgie you know a noogie is preferable. Grilled portabella mushroom, grilled eggplant, havarti, spinach, tomato, cucumber, sprouts and special sauce served on a toasted whole wheat bun. This bully has good intentions you can taste! With your choice of sauce. Meaty and juiced up just right. 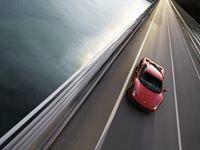 This performs more than one circuit. Turkey, bacon, havarti, iceberg, tomato and sprouts served on toasted beach bread with your coice sauce. Sometimes life's a pickle. So, what's it gonna be? Turkey or ham! Choose black forest ham or fresh sliced turkey and we'll pile it on a fresh sub roll and top it with cheese, iceberg, sprouts, tomato, onion and your coice of sauce. Better than mom makes! This tuna salad comes topped with havarti cheese, lettuce, tomatoes, sprouts and cucumber on a whole wheat bun with your coice sauce. Yeah mon! A tomato cream sauce with an island flair of basil and diced tomatoes is sure to rasta your farian! Served on corkscrew pasta. This mello fettucini in pesto cream sauce will have you as relaxed as a mani/pedi in a mud bath. Aaaaahhhhh! Diced tomato, parmesean cheese. Where‎ baja meets the boot, an alfredo topped with tomatoes, cotija cheese and cilantro. Bueno! Served on fettuccini pasta. 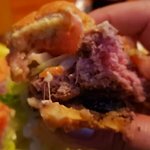 Rehab burgers are 10 ounces of 100% USDA ground chuck beef grilled to order. 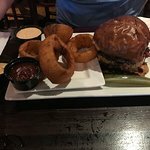 Its lil brother the relapse burger shares this fine heritage but it's a bit sportier weighing in at 5 ounces, great for folks on the run and not ready to make a serious commitment. All burgers are served on your choice of toasted brioche, pretzel or wheat bun with a pickle spear. Includes your choice of skin-on fries or sweet pototoes. We do the grillin and you do the chillin! (Substitute any rehab burger with a turkey burger or grilled chicken breast at no additional cost. Sub onion rings or side salad for just $1.25. Sub gluten free bun at no additional charge. Don't bring your own beer, we have plenty to choose from. 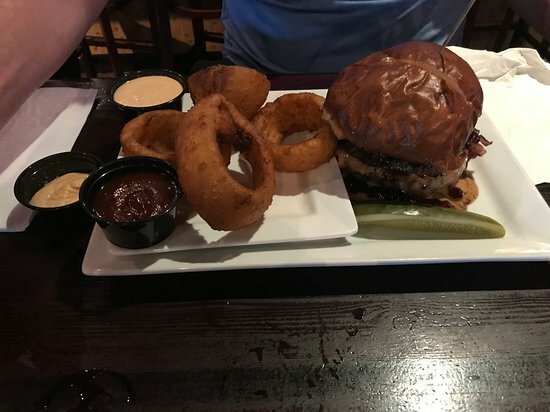 B.Y.O.B means build your own burger around here. After the lettuce onions and tomatoes (L.O.T treatment), it's just.69 or.99 cents per additional toppings. Munchies relief willie nelson would approve of. Your choice of reece's peanut butter cups or hershey's milk chocolate sandwiched between two homemade brownies slathered with marshmallow fluff, served hot in an iron pot. 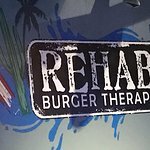 Founded on the idea that everyone deserves a break and the belief it's actually therapeutic to slow down and celebrate life's simple pleasures, Rehab Burger Therapy serves up the treatment you crave in a fun beach environment. 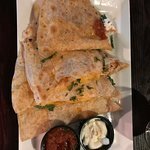 Check In at Rehab and benefit from serious hunger remedies including Pig Wings, Cantina Tacos, Award Winning Burgers, Gnarly Salads, Killer Chicken Wings, Pastas and the famous Pot Brownies dessert. Serious Milkshakes are handmade in the full bar boasting a refreshing list of mixed drinks, home town brews and even adult milkshakes. 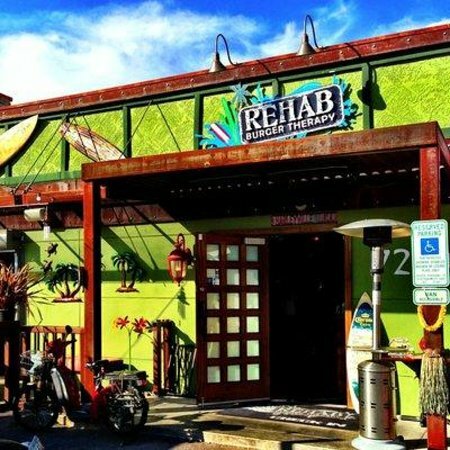 Isn't it about time you found yourself at Rehab? 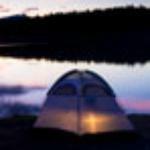 CHECK IN and see what the Buzz is all about! 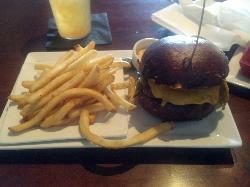 Simply a wonderful cheeseburger and fries. Also, had the fried onion rings. 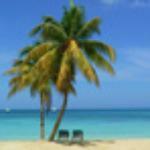 The service was exceptional provided by Brian. 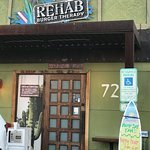 If you are looking for an excellent hamburger experience, then try Rehab Burger Therapy and ask for Brian. You will enjoy the meal and service. 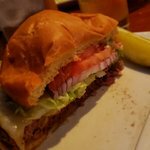 Wonderful PBJ Burger and a great atmosphere! We had a wonderful supper there last night. 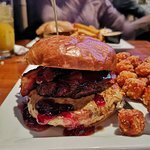 The peanut butter and jelly burger was delicious... sounds strange but tastes fantastic. We also had Chicken Quesidillio which was very tasty... big portion sizes so we have leftovers for lunch today. The staff were exceptional. Amazing!!! 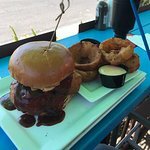 Get the PB&J burger!!! Freaking delicious!! From the food to the service this place doesn’t disappoint. Sat on the porch cold beers and massive burgers....every option available..we ate the back yard BBQ was awesome...staff were great and food was fresh and quick...would go back!!!! 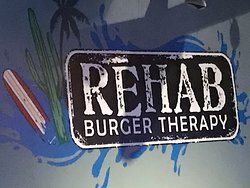 Get quick answers from Rehab Burger Therapy staff and past visitors. Hi! Are you going to be open on Christmas Day? Hi, what would you like to know about this restaurant? Based on the Website, it looks like this restaurant is open every other day 11-11, not on Saturdays. Looks like a great and we'll miss it cause we'll be in Scottsdale on a Saturday. Open on Sat, we had a big dinner there for about 16 of us about a month ago on a Sat evening. Plan to get there early, we got there at 6:30pm and by 7pm there was an hour wait. I do believe that I saw that on the menu. I was not looking for it specifically. they were accomodating on many levels and I am sure that if you ask, they will try to make you happy!